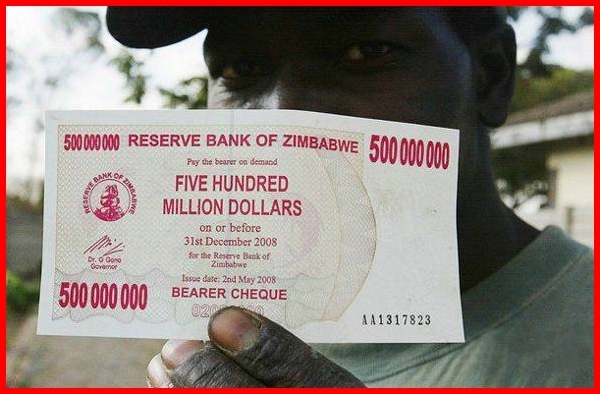 Hyperinflation in Zimbabwe began shortly after destruction of productive capacity inZimbabwe‘s civil war and confiscation of private farms. 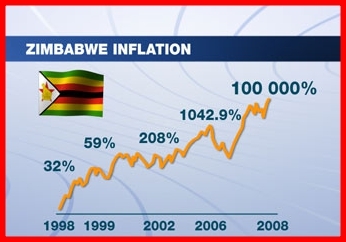 During the height of inflation from 2008 to 2009, it was difficult to measure Zimbabwe’s hyperinflation because the government of Zimbabwe stopped filing official inflation statistics. 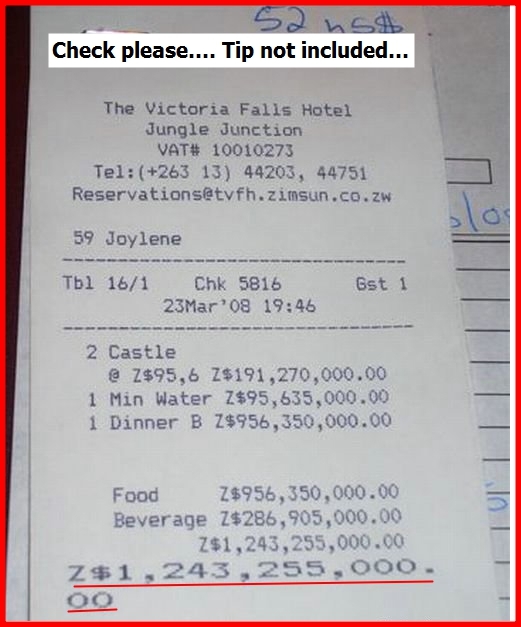 However, Zimbabwe’s peak month of inflation is estimated at 6.5 sextillion percent in mid-November 2008. 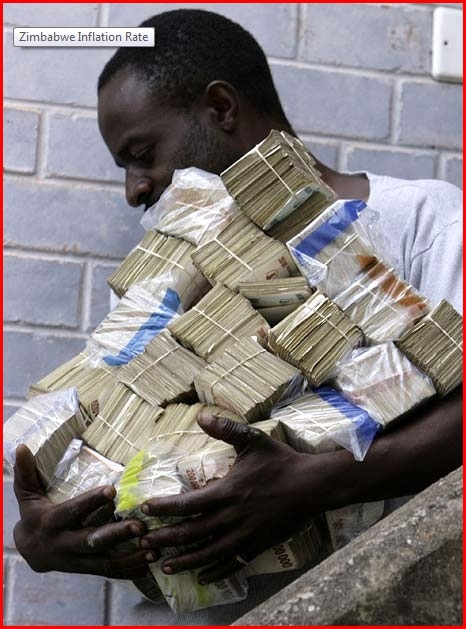 In 2009, Zimbabwe abandoned its currency. As of 2013, Zimbabwe still has no national currency; currencies from other countries are used. On 18 April 1980, the Republic of Zimbabwe was born from the former British colony of Southern Rhodesia. The Rhodesian Dollar was replaced by the Zimbabwe dollar at par value. 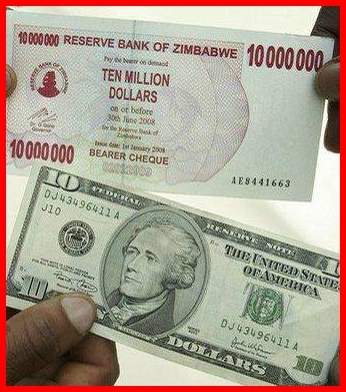 When Zimbabwe gained independence, the Zimbabwean dollar was more valuable than the US dollar. In its early years, Zimbabwe experienced strong growth and development. Wheat production for non-drought years was proportionally higher than in the past. The tobacco industry was thriving as well. Economic indicators for the country were strong. From 1991–1996, the Zimbabwean Zanu-PF government of president Robert Mugabe embarked on an Economic Structural Adjustment Programme (ESAP), designed by the IMF and the World Bank, that had serious negative effects on Zimbabwe’s economy. In the late 1990s, the government instituted land reforms intended to redistribute land from white landowners to black farmers to correct the injustices of colonialism. However, many of these farmers had no experience or training in farming. From 1999 to 2009, the country experienced a sharp drop in food production and in all other sectors. The banking sector also collapsed, with farmers unable to obtain loans for capital development. Food output capacity fell 45%, manufacturing output 29% in 2005, 26% in 2006 and 28% in 2007, and unemployment rose to 80%. Life expectancy dropped. The government blames most of Zimbabwe’s economic woes on economic sanctions imposed by the United States of America and theEuropean Union. These sanctions affect the government of Zimbabwe, and asset freezes and visa denials targeted at 200 specific Zimbabweans closely tied to the Mugabe regime. There are also restrictions placed on trade with Zimbabwe, by both individual businesses and the USTreasury Department’s Office of Foreign Asset Control. ONE BEER… YOU WOULD NEED THIS…. Objectively, that the money has no firm basis to give it a value. Subjectively, that the people holding the money lack confidence in its ability to retain its value. Crucial to both components is discipline over the creation of additional money. However, the Mugabe government was printing money to finance involvement in the Democratic Republic of the Congo and, in 2000, in the Second Congo War, including higher salaries for army and government officials. 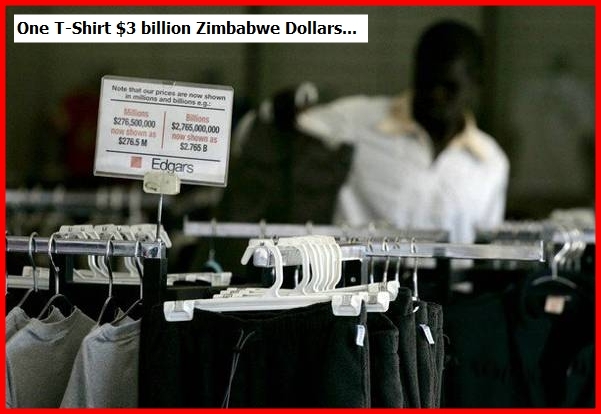 Zimbabwe was under-reporting its war spending to the International Monetary Fund by perhaps $22 million a month. Another motive for excessive money creation has been self-dealing. Transparency International ranks Zimbabwe’s government 134th of 176 in terms of institutionalised corruption. The resulting lack of confidence in government undermines confidence in the future and faith in the currency. Economic mis-steps by government can create shortages and occupy people with workarounds rather than productivity. Though this harms the economy, it does not necessarily undermine the value of the currency, but may harm confidence in the future. Widespread poverty and violence, including government violence to stifle political opposition, also undermines confidence in the future. Land reform lowered agricultural output, especially in tobacco, which accounted for one-third of Zimbabwe’s foreign-exchange earnings. Manufacturing and mining also declined. An objective reason was, again, that farms were put in the hands of inexperienced people; and subjectively, that the move undermined the security of property. Government instability and civic unrest were evident in other areas. Zimbabwean troops, trained by North Korean soldiers, conducteda massacre in the 1980s in the southern provinces of Matabeleland and Midlands, though Mugabe’s government cites guerrilla attacks on civilian and state targets. Conflicts between the Ndebele ethnic minority and Mugabe’s majority Shona people have led to many clashes, and there is also unrest between blacks and whites, in which the land reform was a factor. An aspect of this reform that seeks to bar whites from business ownership induced many to leave the country. Lack of confidence in government to practice fiscal restraint feeds on itself. 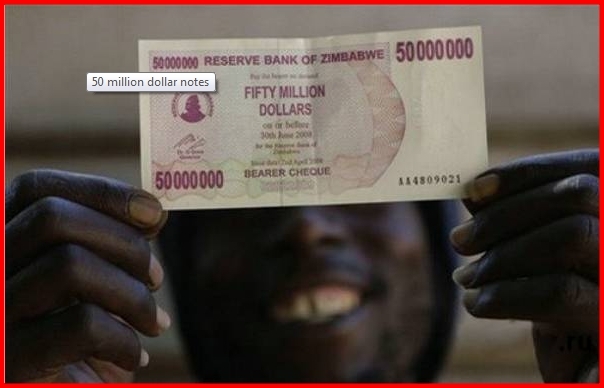 In Zimbabwe, neither the issuance of banknotes of higher denominations nor proclamation of new currency regimes led holders of the currency to expect that the new money would be more stable than the old. Remedies announced by the government never included a believable basis for monetary stability. Thus, one reason the currency continued to lose value, causing hyperinflation, is that so many people expected it to. In 2007, the government declared inflation illegal. Anyone who raised the prices for goods and services was subject to arrest. This amounted to a price freeze, which is usually ineffective in halting inflation. Officials arrested numerous corporate executives for changing their prices. 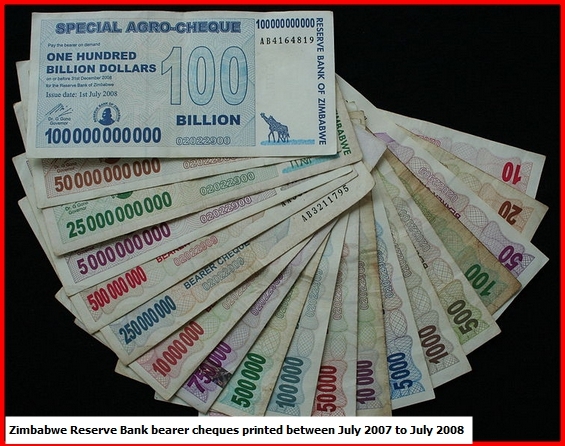 In December 2008, the Central Bank of Zimbabwe licensed around 1,000 shops to deal in foreign currency. Citizens had increasingly been using foreign currency in daily exchanges, as local shops stated fewer prices in Zimbabwe dollars because they needed foreign currency to import foreign goods. Many businesses and street vendors continued to do so without getting the license. 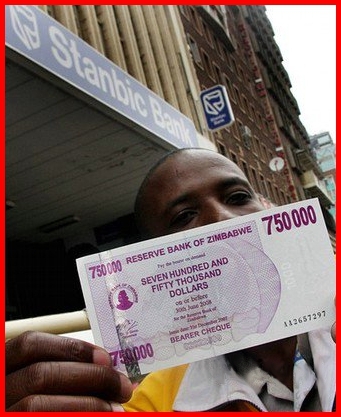 In January 2009, acting Finance Minister Patrick Chinamasa lifted the restriction to use only Zimbabwean dollars. This too acknowledged what many were already doing. Citizens were allowed to use the US dollar, the euro, and the South African rand. However, teachers and civil servants were still being paid in Zimbabwean dollars. Even though their salaries were in the trillions per month, this amounted to around US$1, or half the daily bus fare. The government also used a restriction on bank withdrawals to try to limit the amount of money that was in circulation. It limited cash withdrawals to $Z500,000, which was around US$0.25. 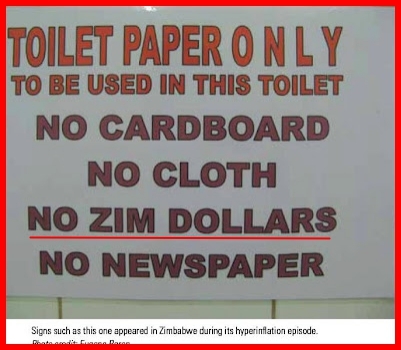 Living with hyperinflation was a challenge for Zimbabweans. 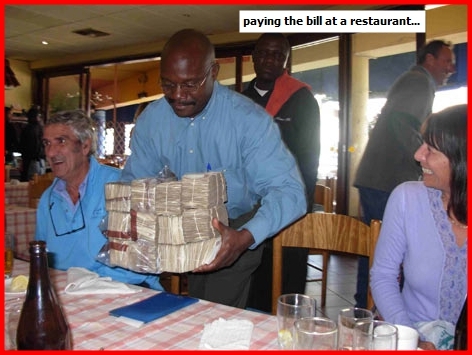 Prices in shops and restaurants were still quoted in Zimbabwean dollars, but were adjusted several times a day. 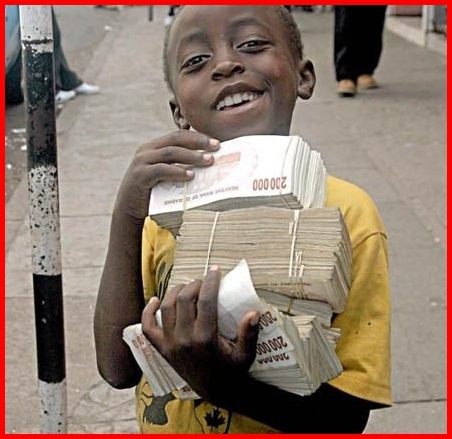 Any Zimbabwean dollars acquired needed to be exchanged for foreign currency on the parallel market immediately, or the holder would suffer a significant loss of value. 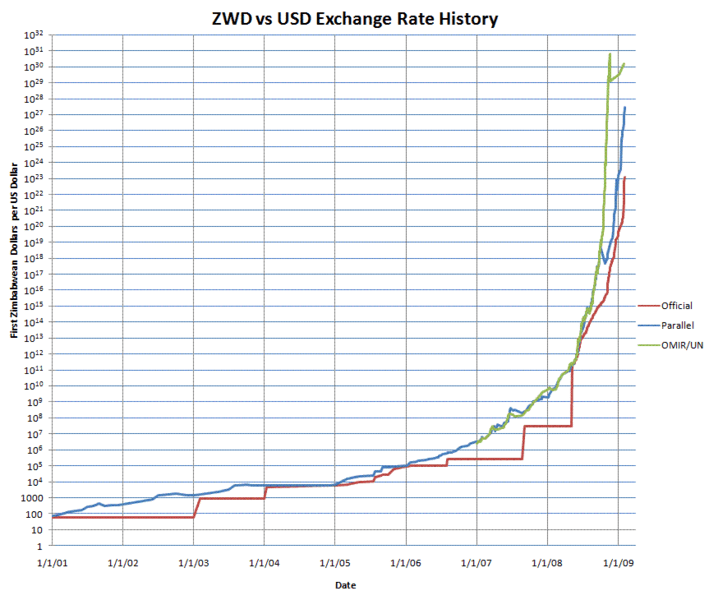 For example, a mini-bus driver charged riders in Zimbabwean dollars, but different rates throughout the day: The evening commute was highest-priced. He sometimes exchanged money three times a day, not in banks but in back office rooms and parking lots. Such business venues constituted a black market, an arena explicitly outside the law. Transactors could evade the price freezes and the mandate to use Zimbabwean dollars. But black-market transactions are not enforceable under law; moreover, transactors are free to flout any other Zimbabwean law. The black market served the demand for daily goods such as soap and bread, as grocery stores operating within the law no longer sold items whose prices were strictly controlled, or charged customers more if they were paying in Zimbabwean dollars. At one point, a loaf of bread was $Z550 million in the regular market, when bread was even available; apart from a trip to another country, the black market was the only option for almost all goods, and bread might cost $Z10 billion. At independence in 1980, the Zimbabwe dollar became the common currency. Originally, the paper notes were Z$20, 10, 5, and 2, and the coins were Z$1, and 50, 20, 10, 5, and 1 cents. 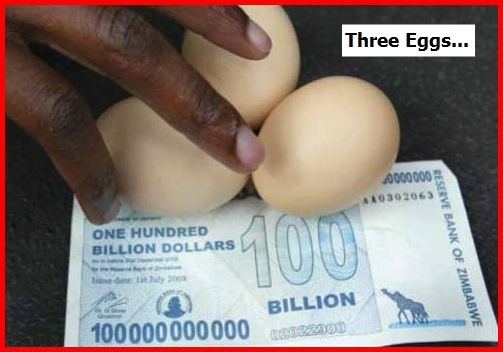 As larger bills were needed to pay for menial amounts, the Central Bank of Zimbabwe planned to print and circulate denominations of up to Z$10, 20, 50, and 100 trillion. 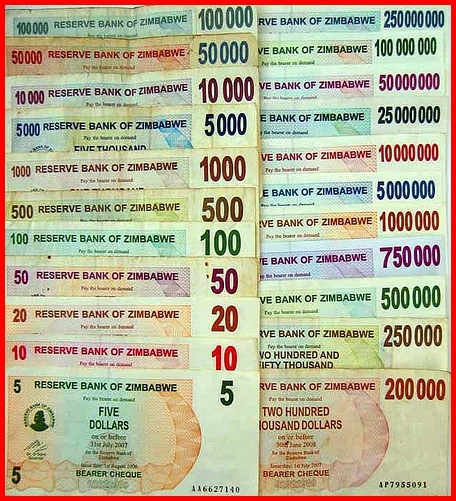 Announcements of new denominations were increasingly frequent; the Z$200,000,000 bill was announced just days after the printing of the Z$100,000,000 bill. The government did not attempt to fight inflation with fiscal and monetary policy. In 2006, before hyperinflation reached its peak, the bank announced it would print larger bills to buy foreign currencies. The Reserve Bank printed a Z$21 trillion bill to pay off debts owed to theInternational Monetary Fund. On three occasions, the Central Bank of Zimbabwe redenominated the currency. First, in August 2006, the Central Bank recalled notes in exchange for new notes with three zeros slashed from the currency. 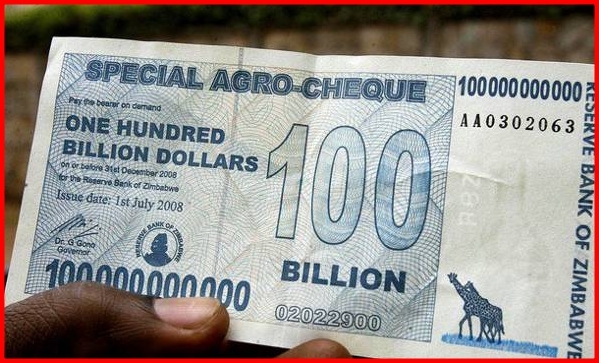 In July 2008, the governor of the Reserve Bank of Zimbabwe,Gideon Gono, announced a new Zimbabwean dollar, this time with 10 zeros removed. 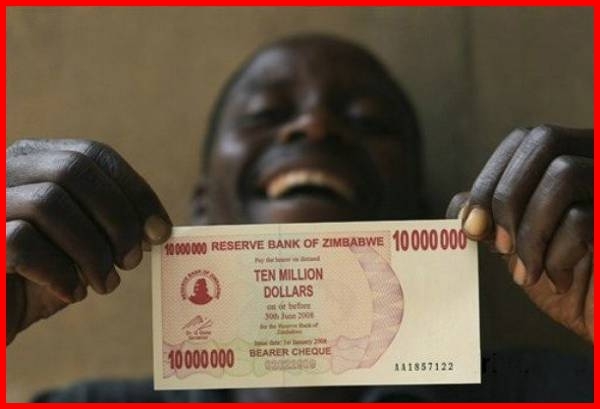 The Z$10 billion would be redenominated to be Z$1. This move was not just to slow inflation but also to make computations more manageable. A third redenomination, producing the “fourth Zimbabwe dollar,” occurred in February 2009, and dropped 12 more zeros from the currency. It was thus worth 10 trillion trillion original dollars, as the three redenominations together reduced the value of an original dollar by 103 * 1010 * 1012 = 1025. 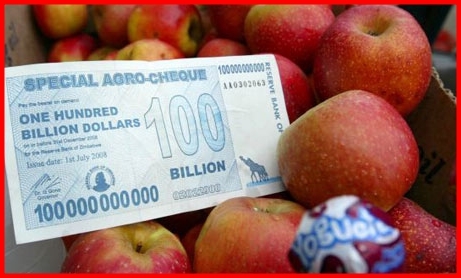 Hyperinflation has been halted within months when government takes the necessary steps. In the meantime, people patronise the black market and informal market for currencies in which they have more confidence. The most direct solution is a credible promise to stop printing unlimited amounts of money. However, Zimbabwean inflation has lasted for five years and the credibility of any promise is problematic. Alternatively, the government could declare some foreign currency to be the nation’s official currency. To facilitate commerce, it is less important which currency is adopted than that the government standardise on a single currency. The US dollar, the euro, and the South African rand are candidates; the US dollar has the most credibility and is the most widely traded within Zimbabwe; or Zimbabwe could join the nearby nations of Lesotho, Namibia, South Africa, and Swaziland, which constitute the Common Monetary Area, or “Rand Zone” by formally deciding to use the rand to promote trade and stability. Short of abandoning the Zimbabwean dollar, Zimbabwe could enact a strict monetary policy. For example, the government would allow the exchange rate to float for a period of perhaps 30 days, so that the market would decide its true value, then declare a fixed exchange rate with the rand and declare the rand a currency simultaneous with the Zimbabwean dollar. 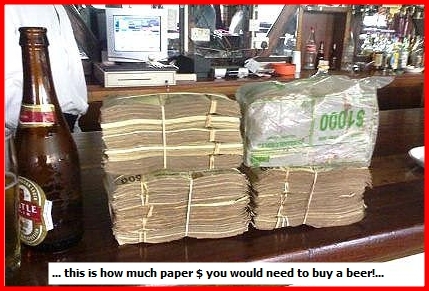 The supply of Zimbabwean dollars would be limited, perhaps by a currency board such as in Hong Kong, which has no other constraint than to maintain the fixed exchange rate. Currently Zimbabwe uses a combination of foreign currencies, but mostly US dollars. A solution has not been decided on as of 2012, and the economy is still in a slump.